A Texas affair leads to a little surprise! Only from USA TODAY bestselling author Sara Orwig. Former army ranger Mike Moretti is finding it hard to remember that Vivian Warner is forbidden. She's his late buddy's widow and his new boss. Mike hired on at the Warner ranch to help Vivian, not to seduce her. But playing the role of pretend suitor leads to irresistible temptation...and an unexpected pregnancy. This cowboy's code of honor demands he do the right thing, but Vivian won't say, "I do," for anything less than love. 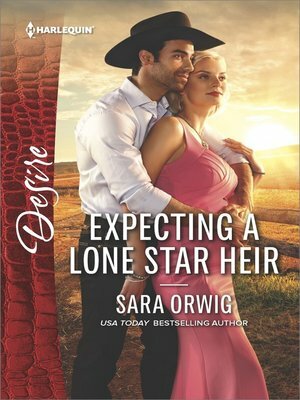 Expecting a Lone Star Heir is part of the Texas Promises trilogy.